Credit: Reprinted with permission from ACS Nano 12, 3, 2569-2579. Copyright 2018 American Chemical Society. Perfection is not everything, according to an international team of researchers whose 2-D materials study shows that defects can enhance a material's physical, electrochemical, magnetic, energy and catalytic properties. "Electronic devices, like transistors, are usually made from relatively bulky stacked layers of metal, oxides and crystalline semiconductors," said Shengxi Huang, assistant professor of electrical engineering, Penn State. "We would like to make them with two-dimensional materials so that they can be faster, smaller and more flexible." To do this, the researchers are looking at molybdenum sulfide single atomic layers. 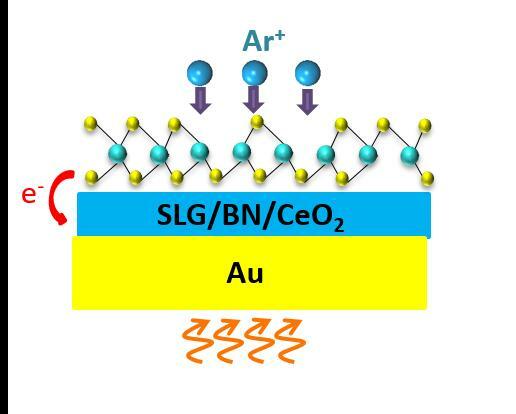 They report the results of their investigation in a recent issue of ACS Nano. Molybdenum sulfide is a molecule made up of one molybdenum atom with two sulfur atoms attached. The molecules line up with the molybdenum in the middle and the sulfur atoms on the top and bottom when forming a 2-D, single-layer, film. These films were placed on a variety of substrates — gold, single-layer graphene, hexagonal boron nitride and cerium dioxide — and irradiated to create defects in the lattice structure. Creating 2-D materials is not a perfect manufacturing process and defects are always present in the lattice. The researchers wanted to determine how those defects changed the physical and electrochemical properties of the molybdenum sulfide. Irradiation causes some of the molybdenum sulfide to lose a sulfur atom from the surface. Using these less-than-perfect films, the researchers could see how the materials changed using a variety of microscopies and spectroscopies. Simulations of lattice defects allowed the researchers to manipulate the materials and produce structures that matched the experimentally defective films. They found that the materials properties results of their simulations matched their experimental results. "We found that the sulfur defects improved the physical characteristics of the material," said Huang. "By choosing the locations and number of defects, we should be able to tune the material's band structure, improving its electronic capabilities." Experimentally, the researchers found that many more sulfur atoms are lost than molybdenum atoms, because the sulfur is on the surfaces and the molybdenum is protected in the middle. They also noted that because so many sulfur atoms leave the material, the defects caused by the absence of sulfur overwhelm any effect the absence of a molybdenum in the lattice might have. Investigating how different substrates enhanced or did not enhance the properties of the two-dimensional material, the researchers found that "the substrates can tune the electronic energy levels in molybdenum sulfide due to charge transfer at the interface." The material properties of the substrate also change the properties of the two-dimensional single layer. Cerium dioxide, because it is an oxide, altered the electrical properties of the material differently than the other substrates. Smaller, faster and more flexible electronics are not the only possible outcome of tuning these 2-D materials. "If we have the right amount of sulfur vacancies, we can enhance chemical processes like hydrogen evolution from water," said Huang. Materials like molybdenum sulfide are used as catalysts in chemical reactions. Huang refers to the splitting of water, a process used to create gaseous hydrogen and oxygen from liquid water where properly defective molybdenum sulfide could enhance the process and reduce the amounts of energy and costs needed and increase the amount of hydrogen produced. Molybdenum is a transition metal and other members of this atomic group also form molecules called dichalcogenides. These include tungsten, niobium, zirconium, titanium and tantalum and they form layers with sulfur and other chalcogenides such as selenium and tellurium. Other dichalcogenides can be made into 2-D materials and may also be tunable to enhance their properties. Also working on this project were Yan Chen, Xiang Ji, Kiran Adepalli, Xi Ling, Mildred Dresselhaus, Jing Kong and Bilge Yildiz of the Massachusetts Institute of Technology; and Kedi Yin, Xinwei Wang and Jianmin Xue of Peking University. The Natural Science Foundation of China, the U.S. Department of Energy, the International Atomic Energy Agency and the National Science Foundation supported this work.